Bella Forcella: Brighton Rocks... In Hebden Bridge! Brighton Rocks... In Hebden Bridge! Much has been written about the similarities between Brighton and Hebden Bridge - tolerant attitudes, an emphasis on contemporary design & style and the natural migration between the towns. So it's appropriate that Element are showcasing the work of Brighton duo Goodman & Morris at their shop in Hebden Bridge. 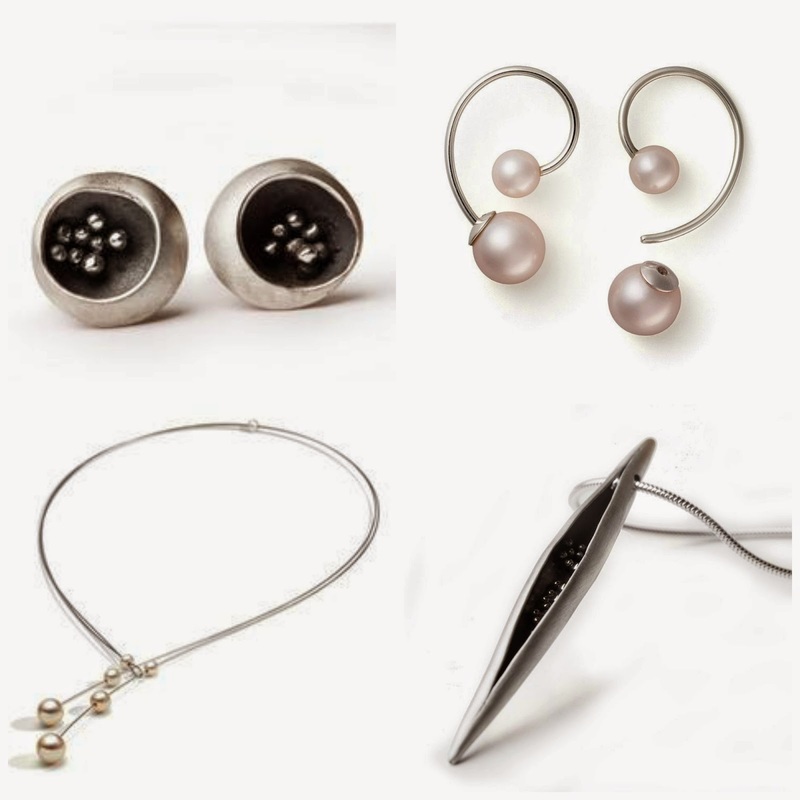 Every year element hold a Spring Designer Jewellery Exhibition, launching new collections from the UK's and Europe's finest and most innovative jewellery makers. 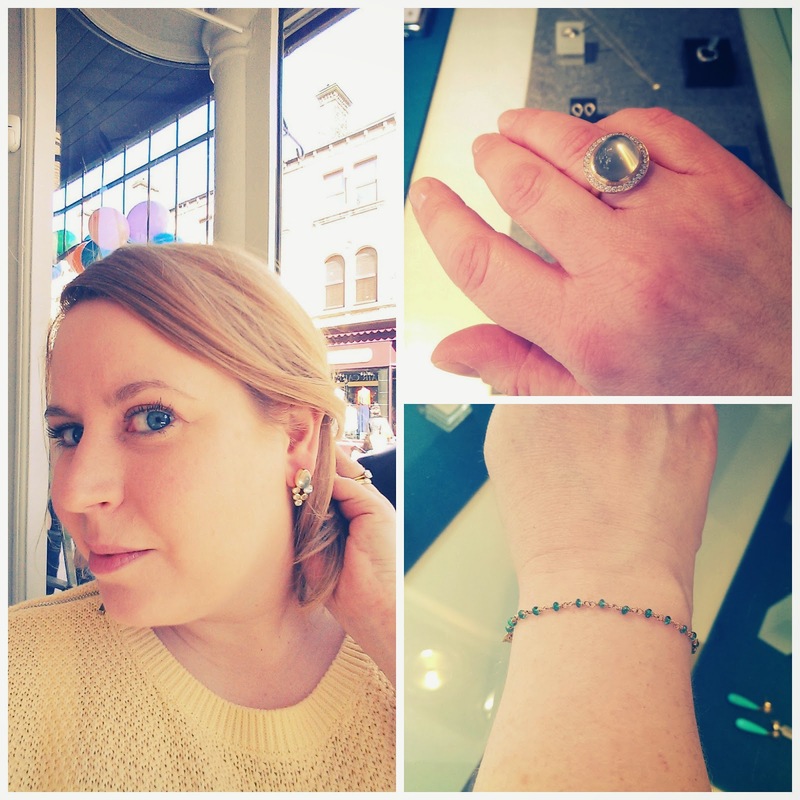 This year's event was titled "Brighton Rocks" and I went along to meet Alex Goodman & Nicky Morris and of course to check out lots of lovely jewellery. Goodman & Morris create beautiful contemporary jewellery and all the work is designed and produced in their shop and workshop in Brighton's historic Laines. I was fascinated as Nicky explained to me how they receive loose gems from their suppliers and then choose stones to build their designs around, "some stones are just so lively" she said, which I feel perfectly describes the jewels in their creations (and as is so clearly demonstrated in the above photo!). Alex & Nicky kindly allowed me to try on some of their jewellery and I was in absolute heaven as I dressed up in these stunning moonstone earrings which looked like droplets of water and modelled this glamorous moonstone & diamond ring and a delicate gold and emerald bracelet. 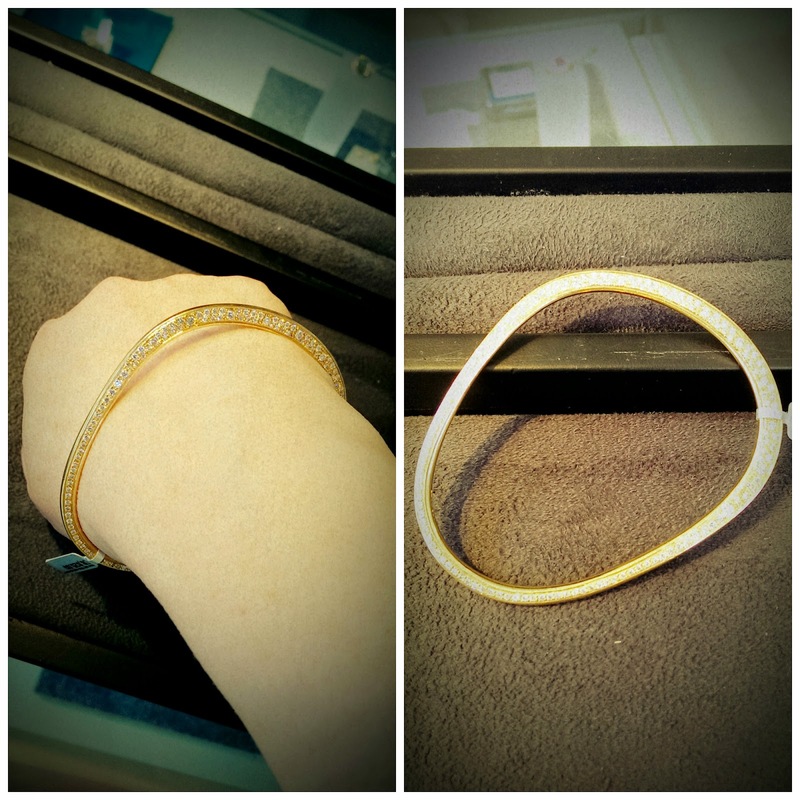 My absolute favourite piece, however (and naturally the most expensive...), was an unusually shaped diamond and 18 carat gold bangle which is designed to sit perfectly on your hand. Have a look at Goodman & Morris' Instagram for more of their gorgeous jewellery and lifestyle photography. Caroline Kindy, who founded Element along with her husband in 2003, showed me around their other new collections for the coming season. Below you can see her wearing a pair of Lesley Strickland earrings which uniquely are made from cellulose acetate (derived from cotton oil) and sterling sliver. 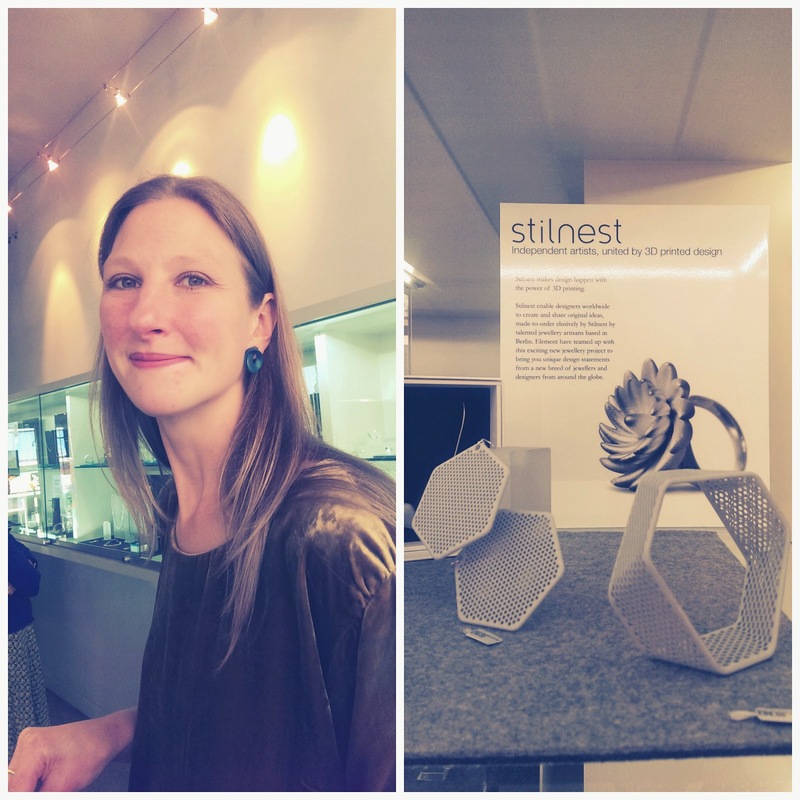 Caroline wearing Lesley Strickland earrings and some of Silnest's 3D printed designs. 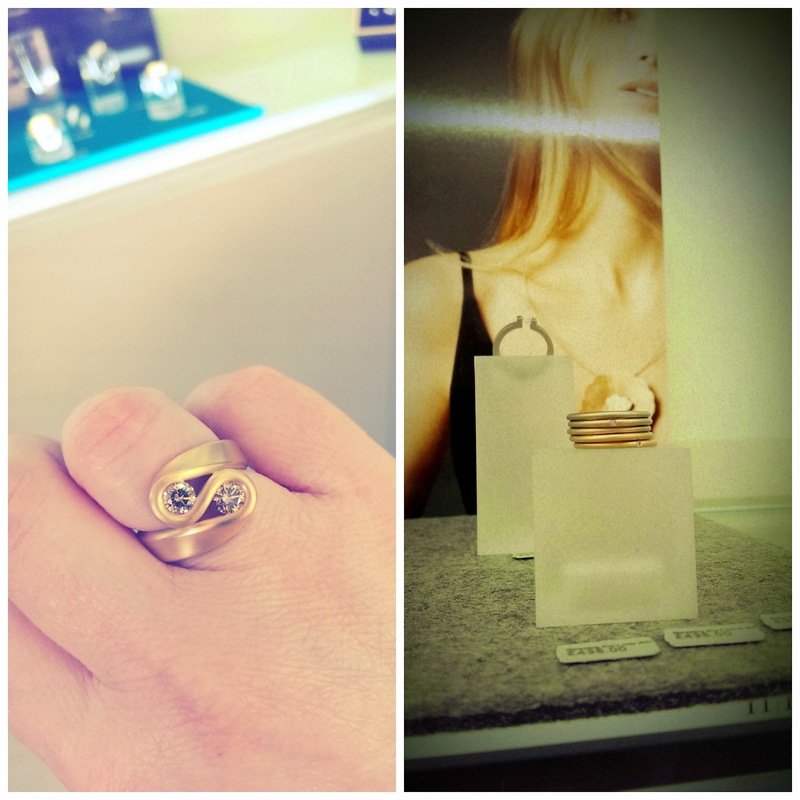 Element are also championing one of the latest techniques in jewellery making - 3D printing. Stilnest are a Berlin-based publishing house and by handling the production and packaging of jewellers from around the world they allow the designer to focus on the design process. I love pearls and I was drawn to the fresh interpretations of a classic by Eva Strepp which I thought were both elegant and modern. 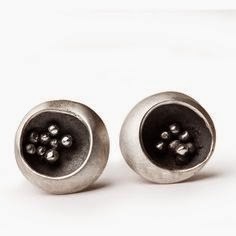 For a more understated look, Stephen Roper's silver jewellery explores natural textures and forms and is created by hand, using traditional techniques. Stacking rings have become very fashionable lately, however these gold and diamond versions from Niessing's Aura Collection (with each beautiful shade of gold having it's own evocative name: Champagne, Apricot, Cloud, Coral & Clay) take stacking to a brand new deluxe level. And finally, I couldn't leave without trying on this fabulous ring by Leen Heyne, especially when I discovered that the stones were chocolate diamonds!! As you can imagine, spending a couple of hours ogling diamonds and jewels whilst sipping prosecco is a pretty perfect way to spend a Saturday morning and I can't wait for Element's next event. 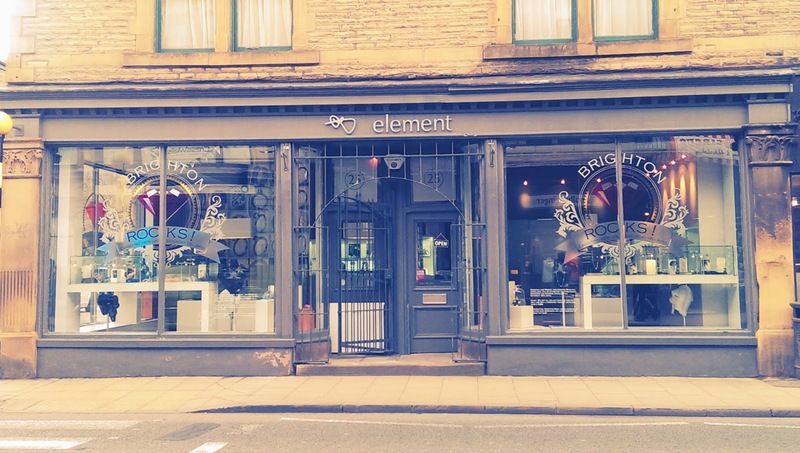 Element is based at 25 Market Street, Hebden Bridge, HX7 6EU, online at elementjewellery.com or you can find them on Twitter, Facebook, Pinterest , YouTube, Vimeo & Instagram. This post was sponsored by Element however all views are my own.